With many thanks to Ebony, who commented on the Stop the Australian (anti) Vaccination Network Facebook page, today we tone it down a little compared to the previous two anti-vaccine chiropractors. This doesn’t mean this post contains anything appropriate, or what we might expect to call “evidence-based”. It’s just the crazy hasn’t been ramped up like the previous chiropractors. There are many common childhood problems that Chiropractic is beginning to show effectiveness in treating. 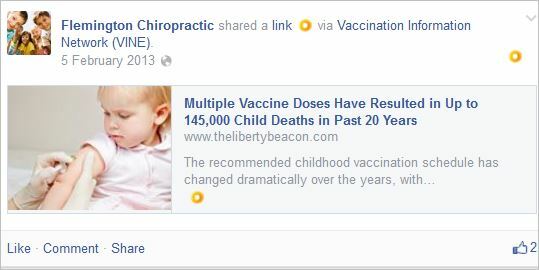 So, we have a known member (past or present) of an Australian anti-vaccination organisation, an organisation which totes an albatross around its soiled neck in the form of a Public Health Warning from the NSW Health Care Complaints Commission; a person who is also a member of an anti-vaccine, US-based chiropractic organisation which calls itself “paediatric”, the leader of which is demonstrably anti-vaccine, who just so happens to teach the Webster technique in prenatal care, just like this chiropractor (for a most excellent exposé of the baseless Webster technique, which is being taught at the CAA NSW AGM seminar weekend, in two days, see this post by Dr Mick Vagg in The Conversation); a person who is demonstrably treating patients according to the outdated and evidence-free tenets of vitalism and the subluxation; and this person treats babies. Musculo-skeletal conditions in infants are uncommon as babies are delivered with mostly pristine spines. 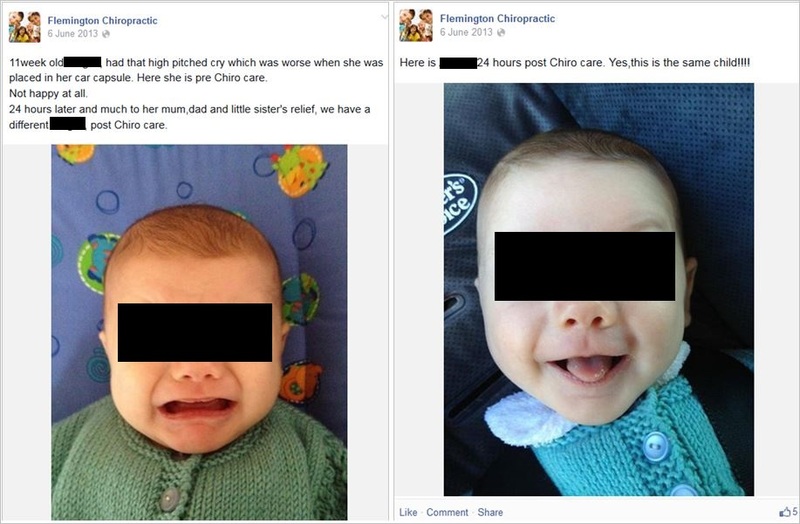 If you need to, feel free to scroll back up the page and compare the following images with what the evidence-based chiropractic department at Murdoch has to say above about some childhood conditions, and the manipulation of babies, and whether or not it is advocated by evidence-based practitioners, or indeed required. You see, I have a real ethical objection to any health care professional using babies and children in their advertising – and let’s not be mistaken, this is advertising and seen as such by the CBA – and I am starting to believe that the use of babies and children by these subluxationist chiropractors would constitute breaches of the advertising guidelines I have previously included, which cover the encouragement of the indiscriminate or unnecessary use of a health service. 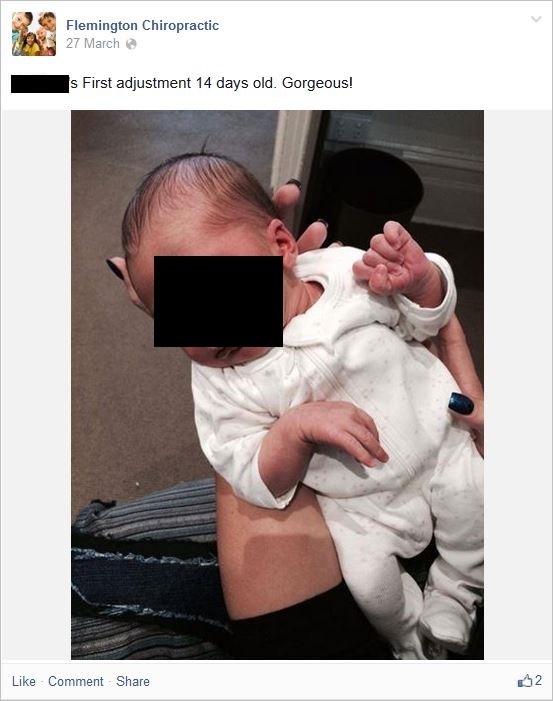 All of the following images [redactions mine] are advertising for the purposes of promoting a service, the adjustment of babies and children, for which there is little to no clinical indication, and which is not substantiated by any robust evidence. If there is some risk, and no benefit (in this plane of reality anyway), then, why is this okay? Now we come to the mostly meme-based claims. Remember what Murdoch University has to say about them. 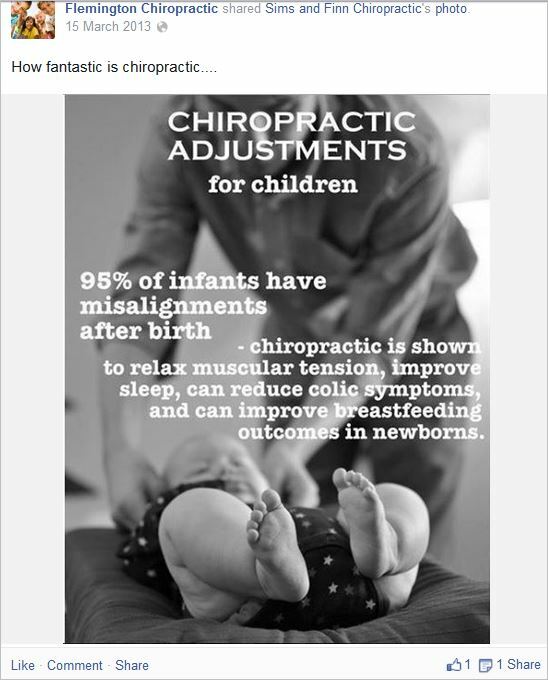 All of the above chiropractic memes are absolutely ubiquitous to the Facebook pages of subluxationist chiropractors. And they are only few grains of sand compared to the unsavoury beach of chiropractic advertising. What you have just seen is extremely common. Are you depressed, yet? 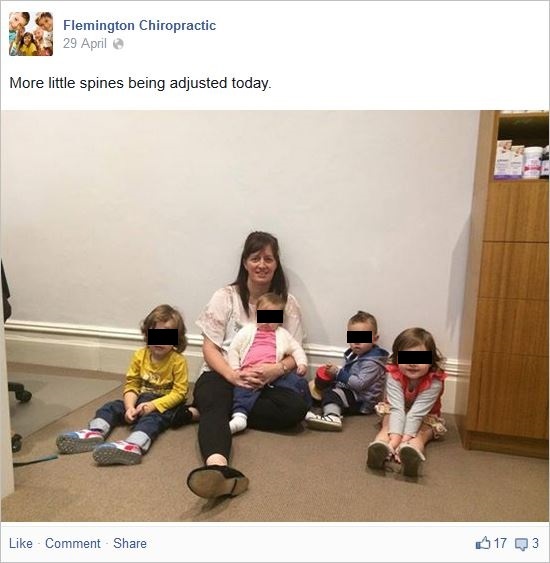 Here’s a message for the Chiropractic Board of Australia, and the various CAA outlets around the nation: you will never be taken seriously while the subluxationists and anti-vaccinationists speak for you on your boards and in the media and on their own Facebook pages. And you will never be taken seriously when the premier chiropractic research organisation in this country, the Australian Spinal Research Foundation, steeped in anti-vaccinationism and founded on subluxations, exists. 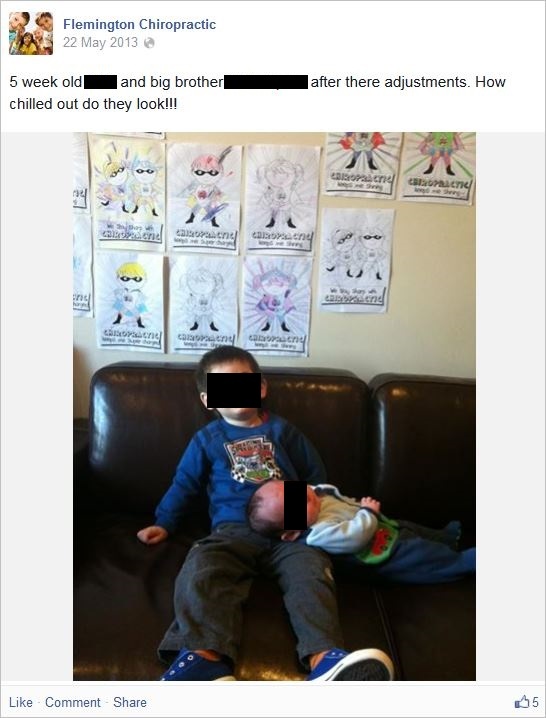 This entry was posted in anti-vaccination dishonesty, australian vaccination network, Health Care Complaints Commission, meryl dorey, skeptic, stop the australian vaccination network and tagged AHPRA, Amanda Boyd, anti vaccination, ASRF, Australian Health Practitioner Regulation Agency, Australian Spinal Research Foundation, australian vaccination network, Australian Vaccination Skeptics Network, Australian Vaccination Skeptics Network - HCCC Public Health Warning, AVN, CAA, CAA NSW, CAA VIC, Chiropractic Board of Australia, Chiropractors' Association of Australia, Chiropractors' Association of Australia New South Wales, Chiropractors' Association of Australia Victoria, Flemington Chiropractic, HCCC, Health Care Complaints Commission, ICPA, Jeanne Ohm, meryl dorey. Bookmark the permalink. A split is increasingly looking like the only option. No!! There must be no option for a split as there is no ( at least public ) option to be anti-vax. 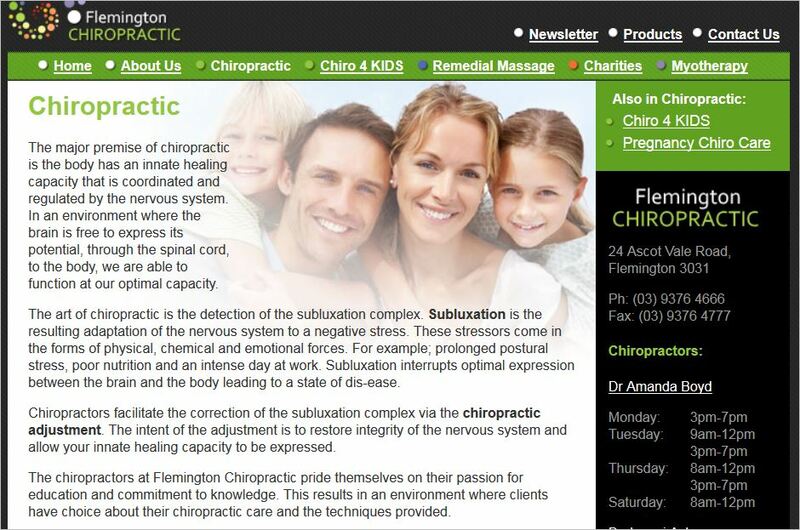 Subluxationists must be deregistered by AHPRA. I wonder what the official CBA view on subluxation is ? Keep up the pressure Hank. I keep finding more, Hank. I blame RMIT, I really do. They’re the only uni in Victoria with a course in chiropractic. 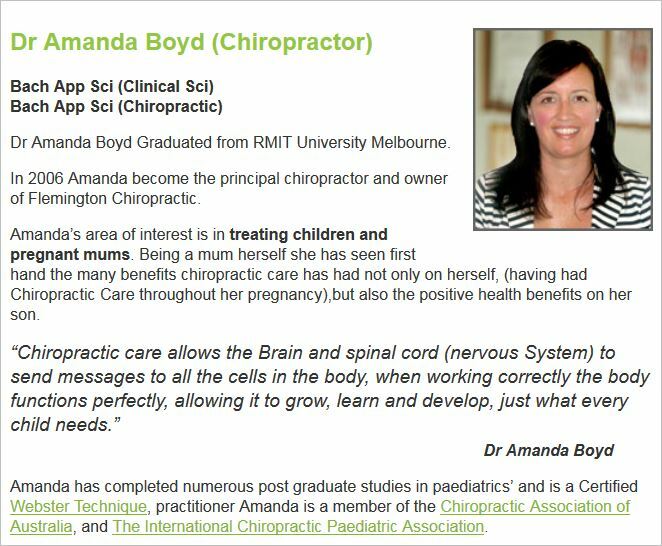 http://www2.rmit.edu.au/Courses/pdf/bp280.pdf Their poster child wants to have a career in equine chiropractic. So . . . you study the human spine and can then treat horses? I thought that was veterinary science? Ahhhh, but you need a much higher ATAR to get into Vet Science at Melbourne (98.5) http://fvas.unimelb.edu.au/study/courses/doctor-of-veterinary-medicine/entry-requirements#nav than chiropractic at RMIT (66.3). It’s time the proper, evidence-based chiropractors took a stand. 66.3? I reckon even I would have a shot at acceptance. Send me in there, undercover! As a ‘mature’ age student . . . I don’t that title either! The NSW rego board, before AHPRA, clamped down on the use of the title and diciplined/fined chiro’s for using it. Then AHPRA came along and gave it even though many in the profession lobbied against it! Inappropriate use of the title is just plain wrong and creates confusion for the public! 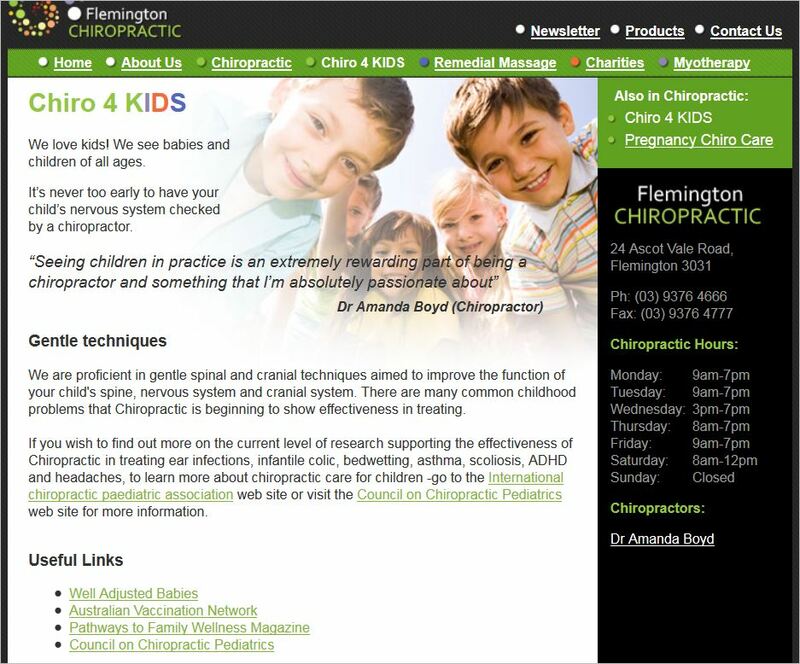 I’ve consistently said to the chiro’s treating children, do the research, prove it and I will use it. Unfortunately they think that solid case studies constitutes evidence. The plural of anecdote is not data! Typo: “I don’t USE that title either”!!! Research in Europe, USA, Canada and Australia consistently put the percentage of subluxation based chiro’s at 15-20%. That is still way too high! I have focused for decades on building a medical referral practice and I work with medico’s in a medical centre, so I have an EBP catering to the 100%, not the 8-10%. I am up to date with my vaccinations as is my whole family. If patients ask about vaccination, I support it, but also say that it is outside my scope of practice so speak to a Dr who is an expert!